A few weathervanes went out just before Christmas with designs based on previous commissions. The first was based on our green woodpecker weathervane, replacing the shunya yantra with the client's house name. 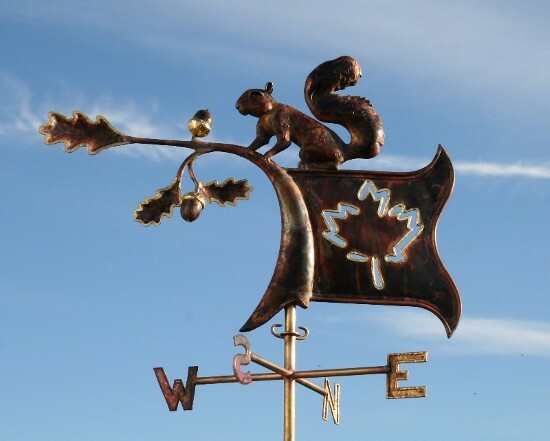 Then another based on the same design, instead using a grey squirrel and a pierced Canadian maple leaf. And finally a smaller version of our hovering kestrel weathervane. But the breaking news is our new wood stove (installed last week). After much research we decided on a Relax wood stove. The guy who did the flue had never seen one before and neither had we actually, until we opened the box! It is top loading and we can pack it full of large logs, offcuts and even sawdust and it pelts out heat. Brilliant. A friend has just built a rocket stove for his workshop, so it will be interesting to compare the two as winter progresses.